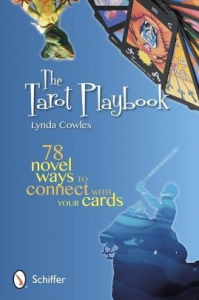 I didn’t quite know what to expect when I received my review copy of “The Tarot Playbook: 78 Novel Ways to Connect with Your Cards” by Lynda Cowles. All I knew was that I was hoping it wouldn’t take itself too seriously. I need not have worried because Cowles has created a whimsical relationship guide to steer you and the tarot deck, or decks, of your choosing to a life long partnership founded on mutual respect, trust, and happiness. You can’t help but get closer to your deck by trying the activities in this book. But if you’re really serious about this relationship and you want it to last forever – like those beautiful, romantic love affairs you see in the movies every day – you must commit yourself fully, with mind, body, and soul. What happens when you finish a reading? Chances are you put your deck back in its box/bag/luxury custom-built cradle and go off to do something else. Think for a moment how that makes your deck feel. Would you like it if your friends only hung out with you when they wanted something from you? Even if you’re a professional reader who spends hours every day with your deck, you should still make the effort to spend quality time with it outside office hours. Make sure it knows you love it for who it is – not just what it can do for you. Take it with you everywhere you go. But don’t just keep it in your bag or pocket – let it see the sights! Lay it on the passenger seat while you’re driving, or buy a special basket for it to sit in when you’re riding your bike. Talk to it about where you’re going and what you can see. Keep it by your side at work and when you go out with your three-dimensional friends for drinks or a bite to eat. Give it a spot on the sofa when you’re watching TV or – better yet – hold it in your hands so you can give it a loving shuffle every now and then. And when bedtime comes, don’t forget to kiss your deck good night. Tuck it under your pillow, safe and sound, and when you wake up in the morning, draw one card to ask it how it slept. If all of this sounds like madness, you’re starting to get a feel for the contents of this book, wherein you’ll find plenty of irreverent, silly, and downright ridiculous things to do with your cards. But, in all seriousness, time spent with your deck is never time wasted. The most amazing readings can occur when Tarot reader and deck are totally in sync, and isn’t that, after all, what it’s all about? “The Tarot Playbook” by Lynda Cowles is perfect for both the person new to tarot and the experienced reader. After all, what tarot deck owner wouldn’t want to know how to build a better relationship with their deck?